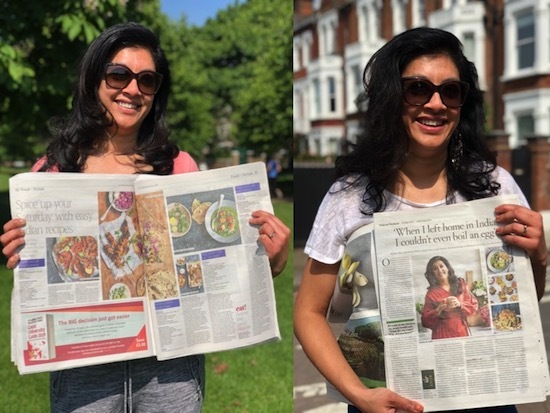 It’s publication day for my new cookbook Masala: Indian Cooking for Modern Living and it’s already had lots of love in the media. The Times newspaper did a double page spread on four “light but zingy dishes” and “easy Indian recipes” from my book. And the latest issue of BBC Good Food Magazine has a recipe from me saying: “fragrant, fresh and spicy… from the new talent transforming Indian cooking”. Waitrose Weekend newspaper did a full piece on my story, how when I arrived in England, I couldn’t even boil an egg. Grab your copy today, and don’t forget to leave me an Amazon review with your honest (and hopefully glowing :-)) feedback!